Fish in ponds can either be harvested completely, or partially. Complete harvests involve removing everything from the ponds, while partial harvests may only remove the big fish (or a certain amount) and leave the rest to continue growing. For a partial harvest, a net is run through the pond and the desired sizes of fish selected from the catch. The rest are returned back into the water. For a complete harvest, a net may be run through the pond about 3 times to catch as many fish as possible. The pond is then drained and any remaining fish collected manually from the harvesting basin. 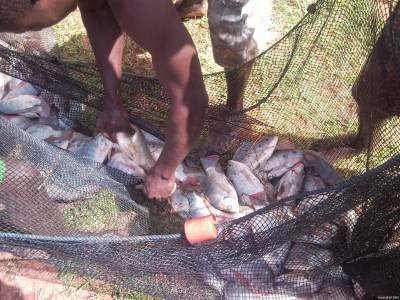 The fish obtained using the net will definitely be cleaner than those collected from the mud after draining.